Another conundrum thrown up by the basic Big Bang theory is how to explain the relative homogeneity and evenness of the temperature of the cosmic microwave background radiation. How did large-scale structures such as galaxies and clusters of galaxies develop out of what should have been a rather boringly amorphous and featureless fireball? This would appear to be in direct violation of the Second Law of Thermodynamics, which describes an inexorable tendency towards entropy and uniformity and away from patterns and structures. If our universe had started out completely smooth, then it should have continued that way, and the universe today would contain nothing more than thinly spread dark matter along with less than one atom per cubic meter of hydrogen and helium gas, with no sign of the texture and complexity we see around us (stars, galaxies, a multitude of elements, life). However, even very slight irregularities in the early phases of expansion would have become amplified as slightly dense patches are affected by additional gravity until they condensed into self-contained structures held together by their own gravity. Galaxies crashed and merged and cannibalized their neighbors, and larger scale structures like clusters and super-clusters formed by a continuing process of gravitational aggregation working on these newly formed galaxies. Heat tends to travel from a hot body to a cold one so that the temperatures of both bodies eventually even out (a result of the Second Law of Thermodynamics itself), like hot coffee in a cold cup. The microwave background radiation discovered by Arno Penzias and Robert Wilson in the 1960s appeared to be extremely uniform throughout the observable universe, with almost no variance. But if, as the evidence suggests, the last time the cosmic background radiation had any contact with matter was about 450,000 years after the Big Bang (by which time the universe had cooled to around 3,000°C), then this presents a paradox, because the universe at that time would already have had a diameter of around 90 million light years, and just not enough time would have elapsed for radiation or heat to have flown around the whole universe and equalized itself, and the horizons could never have actually been in causal contact with each other (known as the "horizon problem"). So, in theory, there actually ought to be even more variation today than there is. That is, unless the very early universe was in fact much smaller than the models were predicting. The most widely accepted theory as to how this might have been possible is known as cosmic inflation, which was first proposed in 1980 by the American physicist Alan Guth, developed out of Steven Weinberg's Electroweak Theory and Grand Unified Theory. As we will see, the addition of inflation to the Big Bang model claimed to solve the horizon problem, as well as one or two other potential problems that had been identified with the standard Big Bang theory, such as the "flatness problem" (why the density of matter in the universe appears "fine-tuned" to be very close to the critical value at which space is perfectly flat rather than a non-Euclidean hyperbolic or spherical shape) and the "magnetic monopole problem" (why the magnetic monopoles which theory suggests should have been produced in the high temperatures of the early universe appear not to have persisted to the present day). 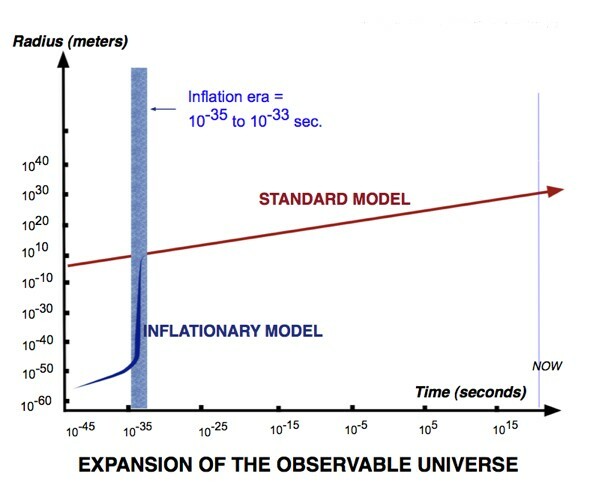 Cosmic inflation is the idea that the very early universe went through a period of accelerated, exponential expansion during the first 10-35 of a second before settling down to the more sedate rate of expansion we are still experiencing, so that all of the observable universe originated in a small (indeed, microscopic) causally-connected region. 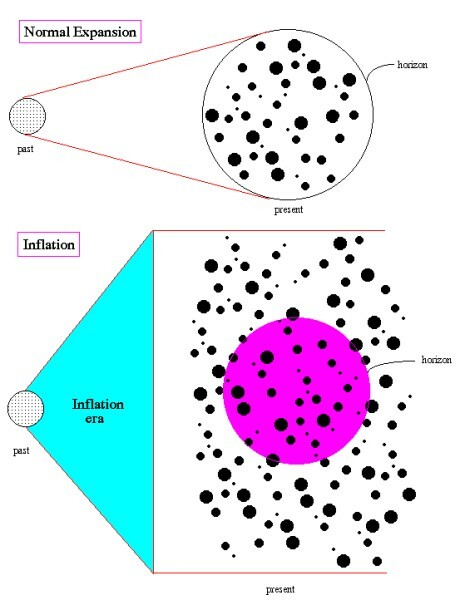 Although the universe has been expanding since the initial Big Bang, inflation refers to the hypothesis that, for a very short time, the universe expanded at a sharply INCREASING rate, rather than at the decreasing rate it followed before inflation and has followed since. By some calculations, inflation increased the size of the universe by a factor of around 1026 during that tiny fraction (far less than a trillionth) of a second, expanding it from smaller than the size of a proton to about the size of a grapefruit. Technically, the expansion during this period of inflation (and even the somewhat slower expansion which succeeded it) proceeded faster than the speed of light. To explain how this is possible (the speed of light being supposedly the maximum speed it is possible to travel), an analogy may help. If two airplanes are flying directly away from each other at their maximum speed of, say, 500 kilometers per hour, they are actually flying apart at 1,000 kilometers per hour even though neither individual plane is exceeding 500km per hour. Thus, "expansion", in terms of the expanding universe, is not the same thing as "travel". It is still not clear to scientists, however, exactly what caused the inflationary phase, the best guess being some kind of a negative "vacuum energy density" (or positive "vacuum pressure") triggered by the separation of the strong nuclear force from the other elementary forces at this time. It is hypothesized that this separation caused a kind of symmetry breaking or phase transition (analagous to the phase transition when water turns to ice), which left the universe in a highly unstable state with much more energy than it would otherwise have had, causing a sharp outward antigravitational effect, smoothing out most of the irregularities in the existing matter and creating vast quantities of particles in a very short time. This theory allows for some kind of very slight unevenness (so-called quantum fluctuations) on a sub-atomic scale at a very early stage in the growth of the universe which provided starting points for the large-scale structures we see in today's universe. This suggests the rather bizarre possibility that the largest structures in the universe, the great clusters of galaxies, may actually have been spawned by sub-microscopic seeds. Guth hypothesized that the reason why the universe appears to be flat is because it is actually fantastically big (in the same way that the spherical Earth appears flat to those on its surface), and that the observable universe is actually only a very small part of the actual universe. In fact, Guth's calculations suggest that the entire universe may be at least 1023 times bigger than the size of the observable universe (the part within the horizon, that we are able, at least in principle, to see), roughly equal to the ratio of the size of the observable universe to the planet Earth. Thus, although the observable universe may appear to be effectively flat, the entire universe may be completely different in nature. Also, although an enormous number of magnetic monopoles could well have arisen in the inflationary early universe, the chances of actually observing even one magnetic monopole are infinitesimally small in a universe of such immense size. Thus, the incredibly vast and fast expansion of the universe caused by inflation "solved" both Robert Dickes flatness problem and Guth's own monopole problem. 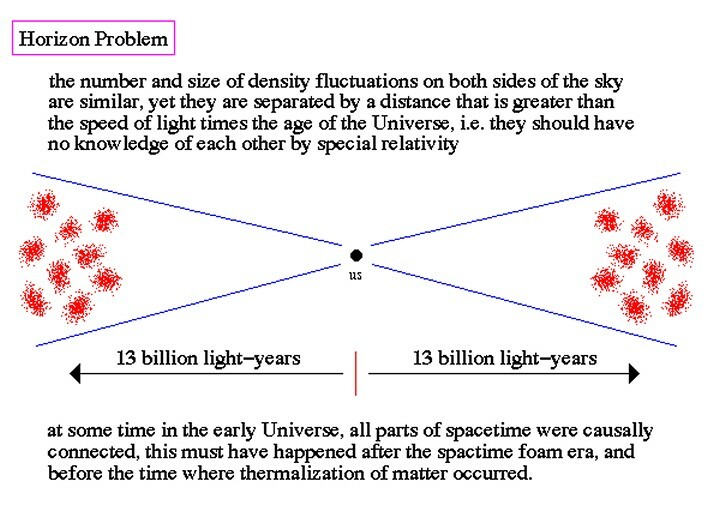 But it also solved the horizon problem: according to the inflation theory, the universe blew up so quickly that there was no time for the essential homogeneity to be broken, and the universe after inflation would therefore have been very uniform, even though the parts of it were not still in touch with each other. In an attempt to prove the inflation theory, the Cosmic Background Explorer (COBE) probe was launched in 1992, and its initial results confirmed almost exactly the amount of variation in the cosmic microwave background radiation that was predicted by inflationary theory. In 2003, the Wilkinson Microwave Anisotropy Probe (WMAP) demonstrated the existence of these non-uniformities with even greater precision. As recently as 2014, astronomers at the Harvard-Smithsonian Center for Astrophysics announced that they had detected and mapped "gravitational waves" within the cosmic microwave background radiation, providing further strong evidence for inflation (and for the Big Bang itself), although further peer reivew of these new findings are still ongoing. Guth's theory has been very influential, even if he himself could find no way to end inflation so that stars and galaxies could form (known the "graceful exit" problem), and he considered his own theory something of a failure because of this. There have been many other refinements and revisions since Guth's original model, such as the "new inflationary model" of Russian physicist Andrei Linde, who had been working on an inflation theory independently (as had Paul Steinhardt and Andreas Albrecht). This new model hypothesized a slow (as opposed to Guth's fast) breaking of symmetry, and the creation of many "bubble universes" (just one of which contains our own observable universe). A later proposal by Linde, known as the "chaotic inflationary model", hypothesized that the repulsive antigravity effect was caused by a "spin-0 field" rather than any kind of phase transition as Guth had thought. Linde's work, and that of fellow Russian Alex Vilenkin, has also given rise to the idea of "eternal inflation", where the inflation as a whole actually never stops, but small localized energy discharges within the overall energy field - almost like sparks of static electricity, but on on a cosmic scale - create small points of matter in the form of tiny particles. Such a process may represent the birth of a new universe, such as our own. Beginning in this way with what we have called a Big Bang, this new universe then itself proceeds to expand, although at a much slower rate than the continuing inflation outside of it. The rest of space outside of that universe is still full of undischarged energy, still expanding at enormous speed, and new universes, new Big Bangs, are occurring all the time. The theory of cosmic inflation, then, supports the scenario in which our universe is just one among many parallel universes in a multiverse. As we will see in later sections, some corroborating evidence for such a scenario also arises from work on dark energy, on superstring theory and on quantum theory. However, the idea of a hypothetical multiverse, which we can never see or prove, is anathema to many physicists, and many critics still remain.